Home › France, 2009 › Franco-Roman Innumeracy? I think so, not that I’m a great expert on Roman Numerals. At home processing our collection of photographs, this is something of an addendum to our recently completed trip around France. One of the places Carol and I visited was Roquefixade. 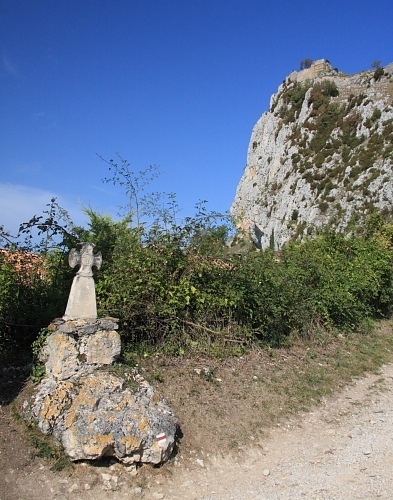 The village nestles beneath a so-called Cathar castle built on a precarious-looking precipice overlooking the village. On our way up to the castle ruins we passed a stone cross which I snapped as some foreground interest when taking a distance shot of the castle for context. I took little more notice of the cross at that time. That can’t be right, can it? “MCM” is Roman for 1900 which, given the dates around here, seems odd enough but to follow that with “D” for 500 makes no sense, surely. I decided that if it meant anything, the 500 would be added to the 1900 which, along with the remaining “XXXVI” would give us 2436. I verified my calculation with a piece of software for converting between Roman numerals and decimal. I was actually expecting an error, I must confess, but, sure enough, out of the software popped 2436. The correct way to Romanize 2436 would be “MMCDXXXVI”, I think. Back to the software to convert 2436 the other way. Sure enough: “MMCDXXXVI”. Could the stonemason have hacked a “D” when he should have hacked an “L”? “MCMLXXXVI” would at least be correct for 1986 but it still seems like an odd date. 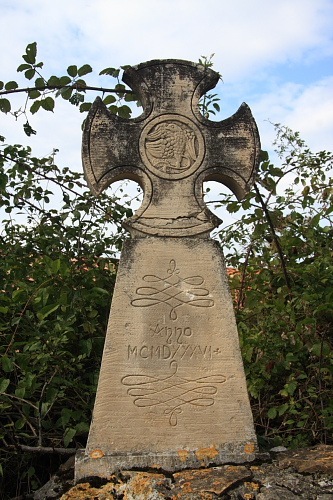 I’ve no idea what that cross signifies or commemorates and I’ve no idea whether the Cathars used a weird calendar. Whatever the reason for that cross’s existence, though, that date just has to be wrong … doesn’t it? I just wanted to say thanks for doing the hard work for me. I got back from France yesterday and I visited Roquefixade with my parents last Friday, 9th October 2009. My mum noticed the stone cross and we wondered what the exact date was, so I said I would google it. I simply put in the search ‘MCMDXXXVI’ and the very first result was a link to your blog answering my very same query! I’m no expert on Roman Numerals, but I agree with you about the stonemason making a mistake. When I have more time, I will do a bit more searching, but like I say I think you’ve already done all the hard work. It just has to be a mistake! Splitting the date up as a from/to kind of thing was very inventive – I certainly didn’t think of that. You wouldn’t think the dash would’ve been forgotten, though.